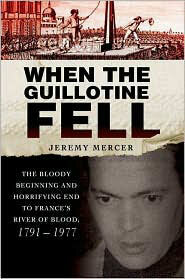 The true crime story of the last man guillotined in French history. This book weaves together the case of Hamida Djandoubi, the one-legged man who brutally strangled Elisabeth Bousquet in 1974, with a philosophical and historical overview of the fight to abolish the death penalty in France. The backdrop for the story is Marseille in the 1970s, a city which faces a declining population, soaring unemployment, and a sad reputation as the world’s heroin capital. In short, the antithesis of treacly, postcard image so many people associate with Provence. This book is the perfect read for the true crime fan who might want a little history and philosophy mixed into the gore and suspense. Consider it a bowl of Fruit Loops with a healthy spoonful of wheat germ sprinkled on top. The book can be ordered from Amazon or Powell’s or Barnes & Noble.